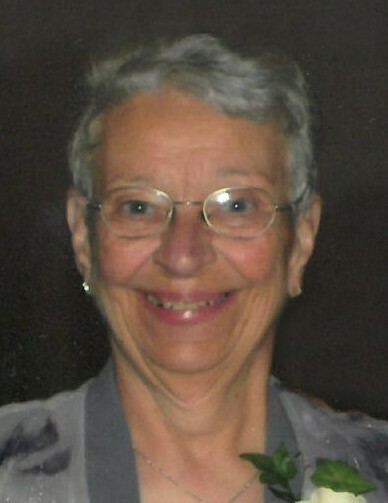 Georgianna “Gena” Petermann 80, passed away on Jan. 24, 2019 at Villa Maria in Fargo, ND. She was born on July 18, 1938 to Wilhelm and Anna Mary (Walter) Urlacher and was the ninth of nine children. Gena grew up on a farm northeast of New England, ND and attended rural grade school. In 1954, she moved to Annunciation Monastery in Bismarck, ND and eventually became a Benedictine Sister, choosing the name Sr. Veronica. She spent sixteen wonderful years as a Benedictine. Gena attended St. Joseph’s Hospital Nursing School in Dickinson, ND and worked as a nurse at St. John’s Hospital in Fargo, ND. On October 17, 1970 Gena married Gene Petermann in Dickinson and made their home in West Fargo, ND. In 1971, Gena attended Kree School of Electrolysis in New York to become an electrolysist. She had her own business for 43 years. Gena and Gene were married for 48 years and had two children, Shawn and Joy. Gena was a member of Blessed Sacrament Catholic Church in West Fargo. She was also a member of the VFW Auxiliary and Blessed Sacrament Holy Rosary Circle. In 1988, Gena received the St. George Award for her outstanding contribution to the spiritual development of youth through Scouting. Gena loved to volunteer. She distributed communion weekly to the local hospital, nursing homes and her fellow church parishioners for over 35 years. She sang for thirty years as a cantor at her church and cooked, and served meals for Churches United for the Homeless for over twenty years. Gena enjoyed putting puzzles together, telling jokes and making people laugh. She loved having a vegetable garden and canning. Her favorite place to be and do was spending time at their lake cabin near Dent, MN which Gena referred to her heaven on earth. The family would like to thank with much gratitude to the wonderful, kind and compassionate caretakers that came into her home, as well as Villa Maria and Hospice of the RRV. Gena is survived by her husband, Gene of West Fargo; her two children, Shawn (Karla) Petermann of Alexandria, MN and Joy (Michelle) Trafas-Petermann of Golden Valley, MN; three siblings, Sally Dolechek of Dickinson, Leona (Andy) Roller of Billings, MT, Edwin (Arlene) Urlacher of Milwaukee, WI, sisters-in-law, Emilia Urlacher of Dickinson, Eleanor Urlacher of Billings, MT; sister and brother-in-law, Marie and Clif Haugen of Arvilla, ND and sister-in-law, Judy Petermann of Fargo; brother and sister-in-law, Mark and Peg Petermann of Horace; and special family friends, Dorothy Hancock and Dalton Fullerton. Gena was preceded in death by her parents, Wilhelm and Anna Mary; siblings, Florian, Frank, Leo, Peter and Valentine Urlacher; sisters-in-laws, Dorothy, Judith, and Verena Urlacher; brother-in-law, Vincent Dolechek; mother-and-father-in-law, Alice and Alfred Petermann, nephew and grand nephews. In lieu of flowers the family requests memorial donations be made to Villa Maria or Hospice of the RRV. Visitation: Sunday, Jan. 27, 2019 from 3 to 4 PM with a rosary and prayer service at 4 PM at West Funeral Home, West Fargo. Funeral Mass: Monday, Jan. 28 at 10:30 AM at Blessed Sacrament Catholic Church, West Fargo with visitation one hour prior.